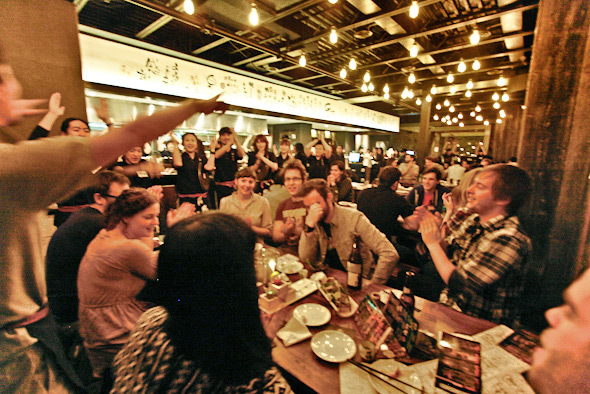 Guu SakaBar is the second Toronto location of the Vancouver-based Izakaya franchise. Just like Church Street's Guu Izakaya , Guu SakaBar is a blast from the moment you enter until the second you step back onto the street. 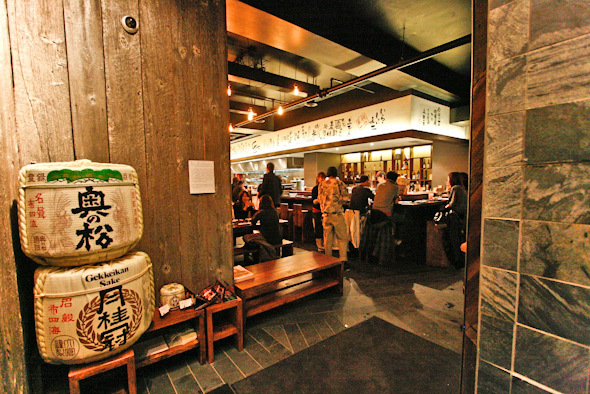 Update: This location has rebranded from Guu SakaBar to Kinka Izakaya. 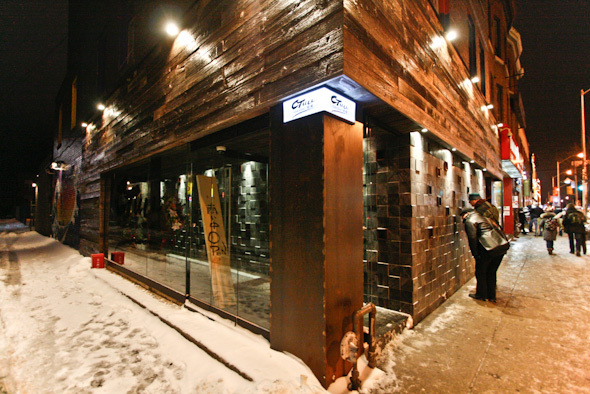 From the sidewalk, Guu SakaBar's facade is an austere brick wall with the look and feel of a sophisticated bunker. But inside, it's a party - quite literally. The cheer that erupts when we walk through the door prompts us to think we've arrived at a shindig held in our honour. This is Guu's usual welcome, but many are actually being celebrated. Throughout our meal, we witness four different birthdays, manifested through frenzied productions led by staff - as servers hand out shooters to those being fĂŞted, their cheers become songs and the whole restaurant gets involved. The host seats us directly beside the sound system and we must discuss menu options over the thumping bass of club beats and the yelling of the energized servers. The atmosphere is electrifying, but this is certainly no place for a quiet date. With its warm lighting and wooden accents, it's hard to believe this beautifully decorated restaurant was once a Burger King. The venue known as "Guu 2" is divided into a cozy tatami-adorned zashiki room and a communal dining room. Seats are also available at the bar overlooking the kitchen. 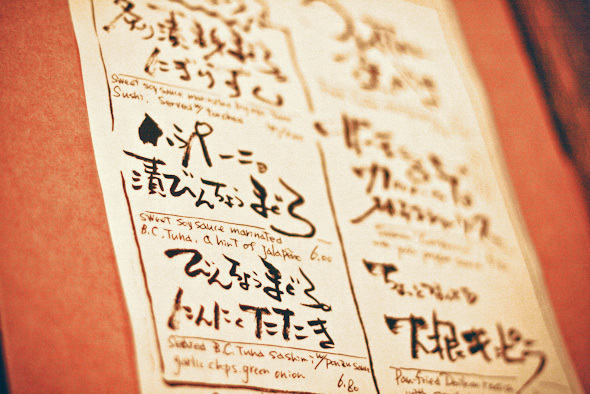 The menu offers an abundance of extravagant Japanese tapas-style creations. Overwhelmed, we select items at random, certain we will not be disappointed. A smiling server takes our order and walks a few steps to yell our meal choices at the kitchen staff. They receive the order and cheer, of course. Allusions to a "fancy Japanese Lick's" are heard on more than one occasion. We start with drinks - Japanese beer is flowing freely, as photocopied signs posted all over the restaurant inform patrons that one dollar from each Sapporo purchased goes to Japan's earthquake relief efforts. Guu SakaBar could earn its way to our heart via our stomachs, but this altruistic gesture gives us another reason to swoon. The first dish arrives quickly. 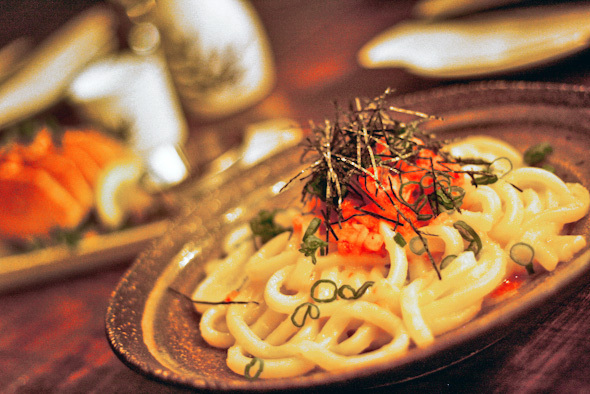 The Kimchi Udon ($7.80) is a bed of deliciously firm udon noodles in a creamy sauce, topped with a mix of kimchi and spicy cod roe. A pinch of nori seaweed adds color and texture to what ends up being our favourite fare of the night. Our next dish is considerably less visually appealing. The Assorted Oden ($7.50) is a sizzling hot pot full of strangely shaped treats. A large disc of taro jelly, a hollow tube of puffed fish cake and a hard-boiled egg are some of the delicacies floating in the steamy broth. Our table is not the biggest fan, but I take a particular liking to the creamy custard-like texture of the taro concoction. Intrigued by the presence of Brie Cheese ($5.20) on the menu, we order it. 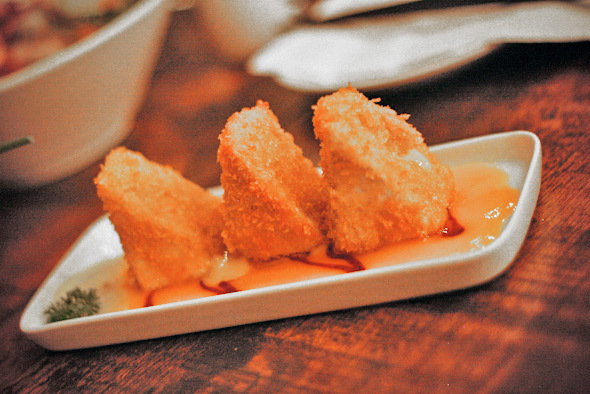 Within a few minutes, three deep-fried wedges of double cream brie arrive at our table, the buttery cheese soaking in a pool of mango sauce. It's a rich treat, but the tart mango balances out its extravagant decadence. The Seared B.C. Tuna ($6.80 - top photo) is one of the best cuts of fish I have ever tasted. Lightly seared and thinly sliced, it melts in the mouth almost instantly. 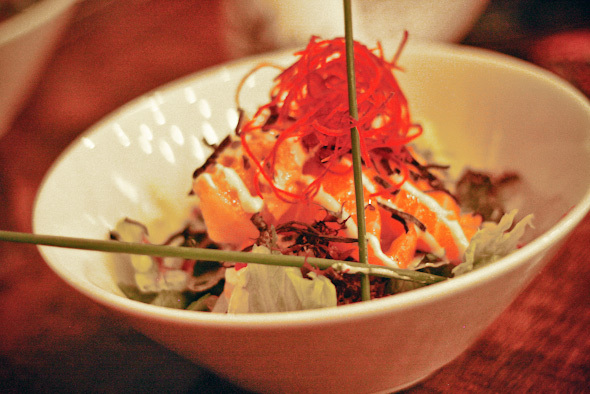 The Sashimi Salad ($7.80) is equally delicious and combines assorted cuts of (raw) fish with shaved daikon, greens and wasabi mayo. The Daikon Salad ($6) is an eclectic and refreshing mix of juicy pieces of radish and cucumber, tender jellyfish and deep-fried potato slivers. By the end of our dining adventure, we are still slightly peckish - this is often the downside of tapas-style meals. Luckily, the dessert options all seem delicious. We share the Green Tea Cheesecake ($4), which narrowly wins our favour over the Almond Tofu ($3.50) and the Sake Tiramisu ($5). Those will have to wait for next time. Guu Sakabar is open from 5 p.m. to 12 p.m., Monday to Thursday, from 4 p.m. to 1 a.m., Friday to Saturday and from 4 p.m. to midnight on Sunday.